Cetaceans (whales and dolphins) are one of my favorite orders of mammals. Not only are they a charismatic bunch, but many are elusive (to say the least) and I love spending time at sea looking for them. Here are a few notes on some of the better spots to observe these creatures around the world. Cetaceans can be pretty tricky to identify. You often get only brief, distant views of an animal (and then only the dorsal fin or tail) from a moving boat. Field guides that include as much information as possible on what the animals look like, as well as their behavior, the shape and size of their blow, diving patterns etc., are the most useful. I must have a dozen books and a few favorites are below. Carwardine, M. 1995. Whales, Dolphins and Porpoises. Dorling Kindersley, London. A nice field guide with information on every species of cetacean, with good illustrations and additional information on how to identify animals at sea. National Audubon Society. 2002. Guide to Marine Mammals of the World. Alfred A. Knopf, New York. Not, to my mind, quite as useful as Mark Carwardine’s field guide for identifying animals at sea, but it complements his book well and includes information on seals and sea lions as well as all the world’s cetaceans. Shirihai, H. and Jarrett, B. 2006. Whales, Dolphins and Other Marine Mammals of the World. Great illustrations, fabulous photos and a lot of useful information on every species. Other regionally specific information is listed with each of the regional whale watching sections below. I haven’t done much whale watching in Africa and it is not a particularly well-developed industry over there. 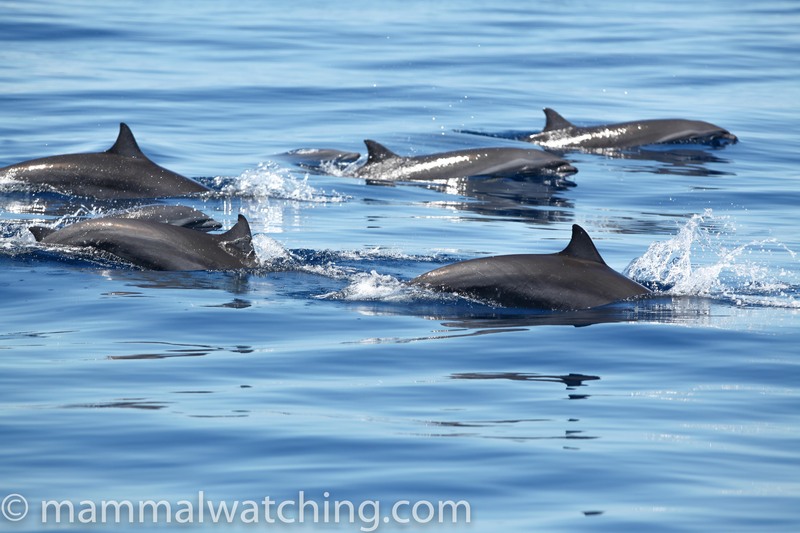 Cape Verde: is home to see nice cetaceans including Fraser’s Dolphins. Check out the country page for more information. Mozambique: there is good Humpback Whale watching in the south. Namibia: Heaviside’s Dolphins are pretty easy to see off Walvis Bay and local tour operators run trips to see them. South Africa: Heaviside’s Dolphins are found along the west coast, and are probably easiest to see around Lambert’s Bay so far as I can tell. But they are regularly spotted around the West Coast National Park too (though not every day). Bryde’s Whales are resident in Plettenburg Bay, on the ‘Garden Route’, and seen on 70% of trips (though it took me three visits to see them), with Bottlenose and Humpbacked Dolphins (Sousa plumbea) often seen too. Southern Right Whales are easy to find around the Cape during the southern Winter. 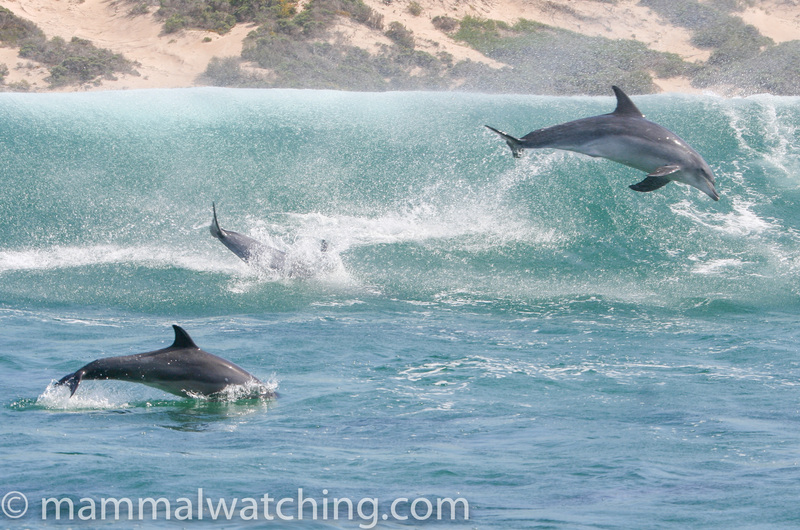 I had a memorable morning watching half a dozen less than 100m off the beach at De Hoop Nature Reserve. Australia is a cetacean-watcher’s paradise. The following brief notes focus mainly on the south east of the country, where on a calm day it isn’t unusual to see 5 or 6 cetacean species on a boat trip out of Wollongong, Sydney or Eden. But the south-east does not necessarily have the best whale watching, it is just the area I know best. That said, Eden, in particular, at the very bottom of New South Wales is a fabulous spot for cetacean spotting – I have seen a dozen species there over the course of various trips. Humpback Whales migrate up and down the east and west coast each year. They head up to their calving grounds during May and June and return, with calves and usually closer in to shore, during September and October. Its worth taking a look from any headland on the southern halves of the east or west coast. There are many whale watching operations around. Eden (at the very bottom of New South Wales) is a particularly good spot to see them. Sperm Whales are quite often seen on the pelagic bird watching trips that go out of Wollongong and sometimes on the Sydney trips too (see Tony Palliser’s Home Page for info on these trips). We ran into a large group (50 or so) Sperm Whales that had congregated off Eden in April 2005. They hung around for a month or more. Blue Whales move into the waters off western Victoria around Easter each year to feed. These “Pygmy” Blue Whales tend not to come in too close to shore but they can be picked up on a good day from the Portland lighthouse for example. I also saw a pod at Easter time a bit closer in, near the 12 Apostles on the Great Ocean Road. Southern Right Whales are often close to the south coast during the Austral-winter. Warnambool is one of the easier places to see them, though the best place is the head of the Great Australian Bight where large numbers can be seen in their calving grounds below the cliffs. Minke Whales (both the Dwarf and Antarctic flavours) could show up anywhere though they are not reported all that often in the south. I saw one Minke (though unsure which species) in Sydney Harbour in July, and have seen Dwarf Minkes out on the Great Barrier Reef in the winter where they are quite common. 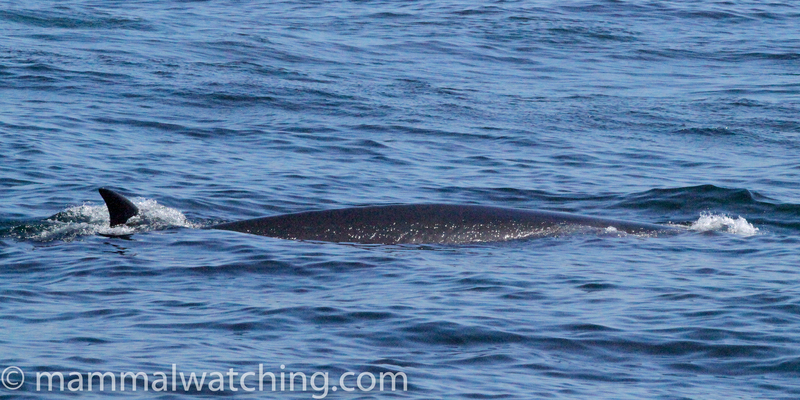 Bryde’s Whales are quite scarce in the south. They are more often seen off the mid-west coast and the Great Barrier Reef (in summer) though they could turn up anywhere. They are, for example. reported once or twice most years from Twofold Bay, Eden. 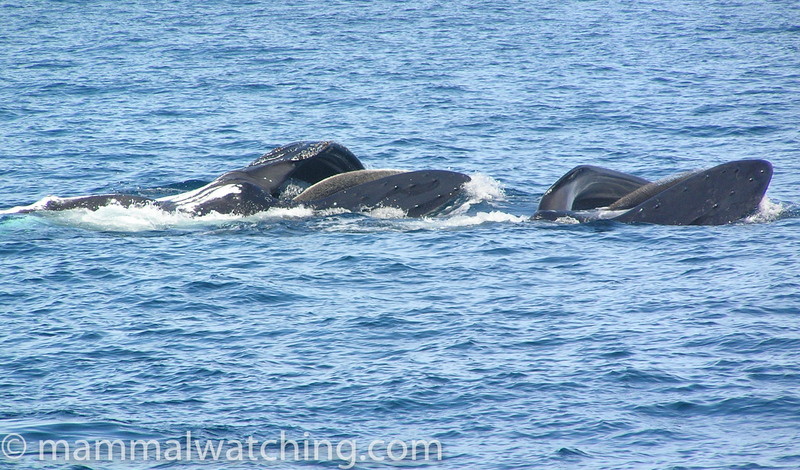 Other Whales: Fin and Sei Whales appear now and again (especially around western Victoria when the Bonney Upwelling is happening – this is the same current system that brings the Blue Whales in at around Easter each year). But neither species are seen often. Plenty of the Beaked Whale species have been recorded in Australia but while animals are occasionally seen from bird watching trips they are rarely identified. Species like Grey’s and Strap-toothed Beaked Whales beach every now and again, as do Pygmy Sperm Whales. Common Dolphins are very common along the south-east coast and seen on just about every Sydney and Wollongong pelagic trip for example. They are ever-present in Two Fold Bay, Eden. Inshore Bottlenose Dolphins (Tursiops aduncus) are common along the east coast, and much of Victoria, and also famously at Monkey Mia, Shark Bay in Western Australia where wild dolphins come to the beach each day to be fed. The larger Offshore Bottlenose Dolphins (Tursiops truncatus) are a bit harder to see, but they see them pretty often off of Eden, or on the Wollongong and Sydney pelagics. A third potential Bottlenose species – the Burrunan Dolphin (provisionally called Tursiops australis though it seems that there is not yet compelling evidence that this is a full species) – is only found in a very few localities at the moment. One is Port Phillip Bay: presumably this is the species tour operators run trips to swim with (see Polperro Dolphin Swims for instance). Its also present in the Gippsland Lakes further east. Risso’s Dolphins are seen quite regularly off Eden, Wollongong and Sydney. I saw a big pod of Pantropical Spotted Dolphins once on a winter trip out of Sydney. Gladstone Harbour is a good spot to see the newly (in 2014) described Sahul Humpbacked Dolphins, while Australian Snubfin (formerly Irrawaddy) Dolphins are off of Darwin and seen pretty much every day in Roebuck Bay, near Broome (ask at the Bird Observatory there for directions and tide times). Spinner Dolphins are quite common out on the Great Barrier Reef and in other tropical waters, while Rough-toothed and Fraser’s Dolphins appear to hang around at Ashmore Reef (a long way offshore west of Broome). Several Blackfish species inhabit Australian waters though none is that easy to see. It took me six years to see my first Pilot Whales in Australia (Short-finned Pilot Whales on the edge of the shelf off Eden in May 2005). And it took me seven years to see my first Killer Whales. They are reputedly quite common off Tasmania and, while they might turn up anywhere, are probably seen most often in the Eden-Merrimbula area when the Humpbacks are migrating south. Fun fact, I spent 22 hours at sea one weekend looking for them from a charter boat in 2003 to no avail only to get back to work to hear my boss had seen them from the Merrimbula golf course – their splashing had “nearly put him off his game” ….. False Killer Whales are regular along the east coast (and sometimes spotted from the land). Pygmy Killers and Melon-headed Whales have been reported a few times from pelagic bird watching trips off Wollongong and the Gold Coast (I saw the former once). New Zealand: Akaroa is a good spot to find the endemic Hector’s Dolphin. Not easy to find from land, I spent several hours looking from good vantage points over the bay in calm conditions without any luck. But the dolphin swimming boat-trip I took got onto them pretty easily. The town of Kaikoura is scenically stunning, with its snow capped mountains rising up from the shore. Dusky Dolphins are easily seen on the dolphin swimming trips, and New Zealand Fur Seals haul out near town. Sperm Whales are seen on 90% of whale watching trips. Many other species are seen occasionally and I saw a Humpback Whale in July 2004. The spectacular Southern Right Whale Dolphins are occasionally reported in mid winter. Dare to dream! Timor-Leste: in late 2008 joint research between the Australian Institute of Marine Science and the Timorese government discovered that the deep water just off the Timor-Leste coast was a “global hotspot” for cetaceans. In one day alone, more than 1000 individuals from 8 species were spotted, including Short-finned Pilot Whales, Melon-headed Whales, Spotted, Spinner, Striped, Risso’s, Fraser’s, Bottle-nosed and Rough-toothed Dolphins together with Blue and Beaked Whales. Humpbacks also migrate through the area. I visited in October 2010 and saw Melon-headed Whales, Short-finned Pilot Whales and Fraser’s Dolphins in abundance during a morning at sea out of Dili. See the Timor-Leste page. Mexico: the Sea of Cortez in Baja Mexico is one of the most famous whale watching destinations in the world though I haven’t been yet. The only Mexican cetacean watching I have done was from Puerto Vallarta where I swam with Bottlenose Dolphins off Puerto Vallarta in the Bay of Banderas. Grey Whales and Humpbacks are common in the area at different times of year, with Bryde’s Whales, Spinner and Spotted Dolphins all there from time to time. I was told Rough-toothed Dolphins were common outside the Bay of Banderas (the best way to see them would be to pay to go on a local fishing boat). See the Mexico page. California: Monterey Bay Whale Watch offers some of the best cetacean spotting in the world. September is one of the better times of year for diversity and numbers of species. During three 4 hour trips in 1998 we had Blues, Humpbacks, and a Fin and Minke whale, Long-beaked Common and Pacific White-sided Dolphins (the former in pods of many hundred), Harbour and Dall’s Porpoise and Risso’s Dolphins. Other species include Northern Right Whale Dolphins (are patchy but can be there in huge numbers and I finally saw some in 2016), Orcas (regular especially mid April through mid May) and Baird’s Beaked Whales (seen several times most Septembers). Maine: has a sizable whale watching industry. I finally saw Atlantic White-sided Dolphins out of Bar Harbor in September 2014, along with Fin and Minke Whales and Harbour Porpoises. Bar Harbor, especially later in the season seems one of the more reliable spots to see White-sided Dolphins, perhaps because boats travel 25 miles off shore to Mount Desert Rock Lighthouse. A day before I went out they’d seen a Sperm Whale and had heard reports of a Blue Whale too. Both very unusual in these waters. 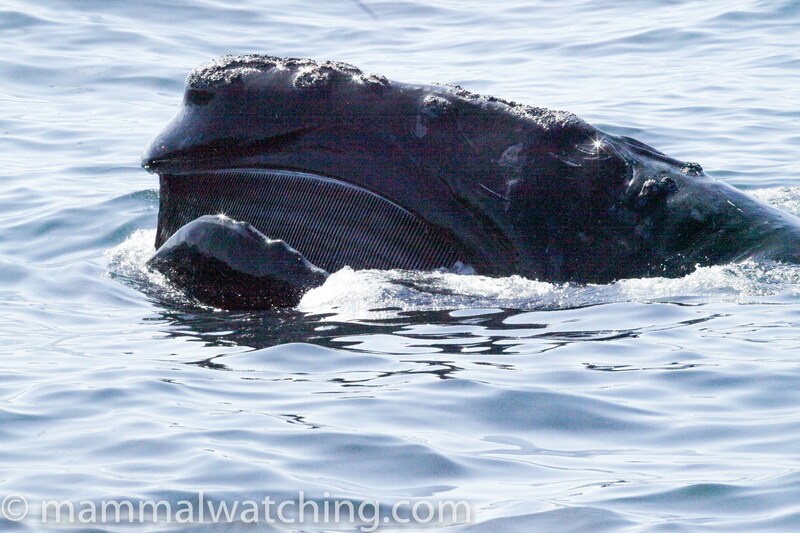 Humpbacks are common and Right Whales seen from time to time too. Bar Harbor Whale Watch seem to be the only show in town. Massachusetts: Stellwagen Bank,the focus of many boat operators along the Massachusetts coast, has Humpback, Fin, and Minke Whales (daily from spring to fall), Northern Right Whales (fairly common until mid May), Sei Whales very uncommon (and possibly seasonal – I saw 3 here in May 2013), and White-sided Dolphins occasionally. Hydrographer Canyon, reached via all-day fishing or birdwatching trip from Cape Cod, is at the edge of the Continental Shelf and has Risso’s Dolphins, Sperm Whales, Short-finned Pilot Whales, Common Dolphins, Bottlenose Dolphins, and rarely beaked whales. 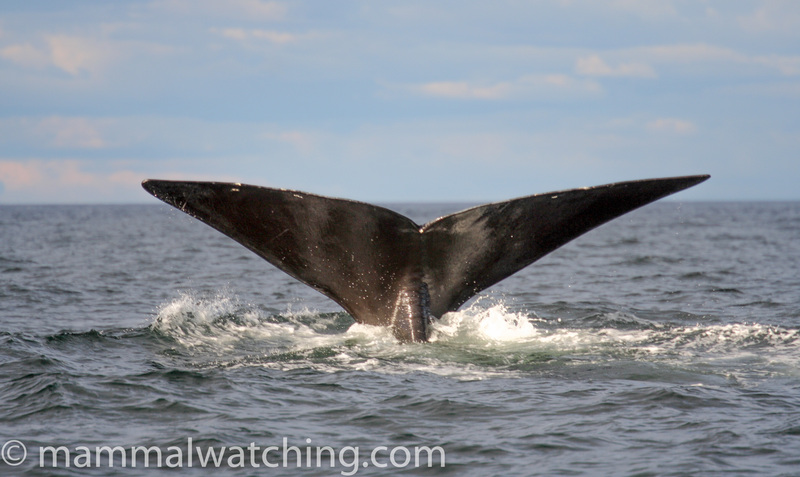 Here is an article on land-based whale watching on Cape Cod. North Carolina: pelagic birding trips from Hatteras turn up quite a few cetaceans apparently including Humpback Whales (seasonal), Risso’s Dolphin (uncommon), Sperm Whales (uncommon but regular), and, quite often, Offshore Bottlenose and Atlantic Spotted Dolphins as well as Short-finned Pilot Whales. Other species regularly seen are Cuvier’s Beaked Whale and less a few times a year Gervais’ Beaked Whale (Hatteras is probably the only place in the world where you have a chance of encountering and identifying this species at sea). Trips have also encountered False Killer Whale, Clymene Dolphin, and Fin Whale. I took a great trip with Patterson Pelagics in August 2016 and saw both Atlantic Spotted Dolphins and Gervais’ Beaked Whales. British Columbia: Vancouver Island is good for Grey Whales pretty much year round. The entire population travels past the island during the spring migration north, which runs from February through May, and the animals swim south again in the late Autumn and Winter. A small population remains off the west coast and spends the summer feeding close to shore, and whale watching boats operate out of Tofino to see them. The Tofino trips often also see Humpbacks, Orcas, Harbor and Dall’s Porpoise and Pacific White-sided Dolphins. Killer Whales seem fairly common all around the island, with trips leaving daily from Sidney (Victoria), for example, to see them. New Brunswick and Nova Scotia: there are Northern Right Whales in the Bay of Fundy reliably from mid August through October. Humpbacks, Atlantic White-sided and White-beaked Dolphins, Fin Whales and Harbor Porpoises are all regular too, though the Dolphins don’t arrive until later in the year. Grand Manan Island seems the best location for the Northern Right Whales, though the species is also seeable – but probably less often – off of Nova Scotia and further afield (e.g. the Gulf of St Lawrence and Massachusetts). Newfoundland: there are many whale watching operations around the coast, though cetacean watching is only generally available in the shortish Newfoundland summer from June through early September. 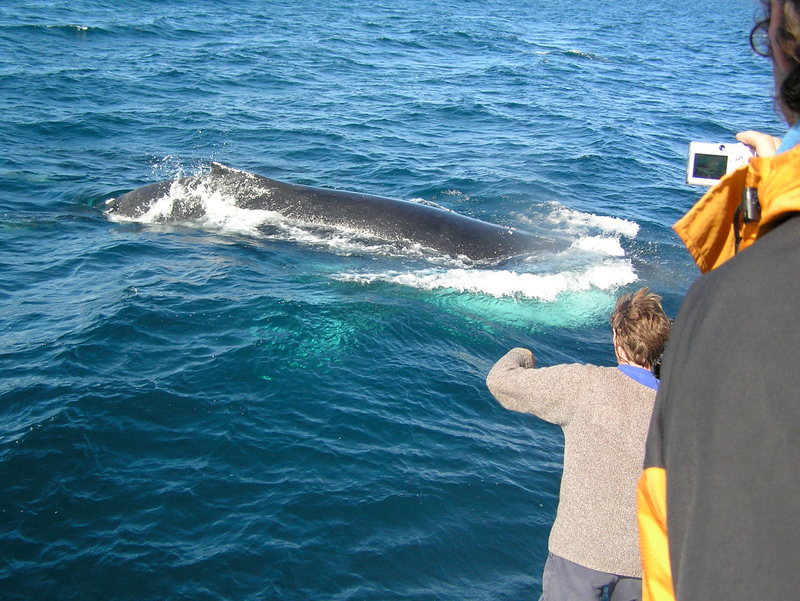 Whale watching is mainly focused on Humpback, Minke and Fin Whales along with White-sided and White-beaked Dolphins. Pilot Whales and Harbour Porpoises are common too. The North West Territories: Inuvik, at the top of the Dempster Highway in the Canadian north west, is the end of the road and a base for short scenic flights to some of the islands in the Beaufort Sea. Bowheads and Belugas are often seen from the air in the summer. Nunavut: Baffin Island has Narwhals, Bowhead Whales and Belugas through the summer months, often in close to the edge of the ice floe, or even in cracks in the ice. Pond Inlet and Igloolik are two places where you can arrange trips to see these animals from land or sea, though you’d be well advised to make arrangements before you get there (trips often involve overnight stays and long journeys over the sea ice which can be difficult to arrange at short notice). Quebec: Belugas live year round in the St Lawrence River, and there is a large whale watching industry based around Tadoussac. The Belugas are quite easy to see from the land or from the ferry that plies between Riviere du Loup and Tadoussac. In the summer the Belugas are joined by many Minke, Fin and Humpback Whales, with occasional Blue Whales and Orcas. In 2018 there were reports of a Narwhal here too. 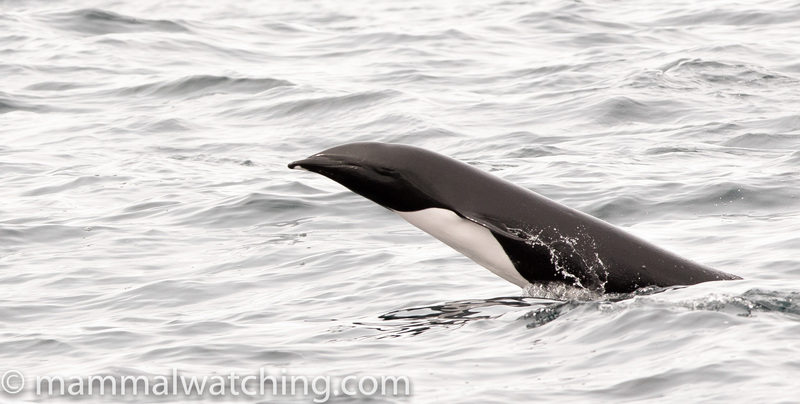 White-sided Dolphins and Harbor Porpoises are around too. Although the White-sided Dolphins are rare in Tadoussac they are supposedly easy to see in the second half of August off of boat trips leaving from Perce on the Gaspe Peninsula. The Amazon: the pink river dolphins – Botos – of the Amazon basin are quite easy to see in Peru, Brazil and other places. 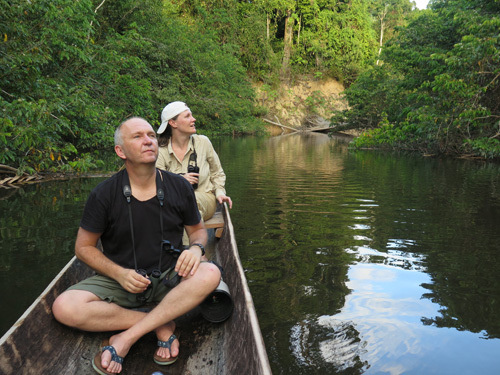 Tucuxis are also common in parts of the Amazon. I saw plenty of both species on the journey Brazil’s Palmari Lodge in the western Amazon, around Tapiche Reserve in Peru and on the rivers around Manaus. 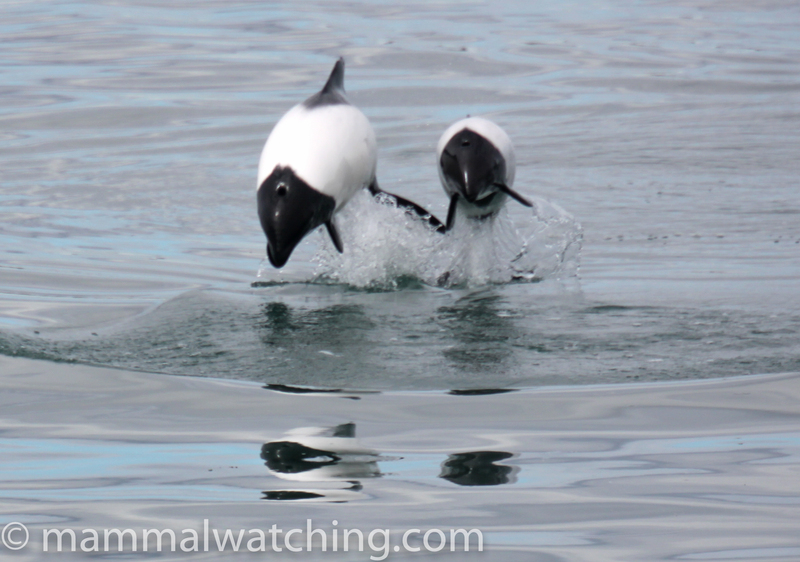 Argentina: Peale’s and Commerson’s Dolphins have been reported off of Cape Virgin in Patagonia (the straits of Magellan). Puerto Deseado in southern Argentina is supposed to be a good place to find operators to take you out looking for these species. Southern Right Whales were very common off of the Valdez Peninsula in August and Orcas are also a common sight in certain months when they hunt sea lions off beaches. Brazil: the recently split Guiana Dolphin (Sotalia guianensis) is quite common along the Atlantic Coast and can be seen at Ilheus and on the way to Superagui Island for example . See my Brazil reports. Guiana Dolphin, Sotalia guianensis. Paranagua, Brazil. Chile: the gorgeous Commerson’s Dolphins should be easy to see – at least if the tide is running the right way – from the ferry between Punta Delgada and Tierra Del Fuego in Patagonia, or from the coast (try Punta Dungeness for example). Peale’s Dolphins and Chilean Dolphins can be tracked down off of Chiloe Island and are also common off Patagonia. At the northern end of the country, Burmeister’s Porpoises can often be seen from the beach at Arica. Costa Rica: I didn’t go looking, but the Osa Peninsula is probably the best whale watching destination in Costa Rica. More interesting species seen seasonally/year round include Spinner, Pantropical Spotted and Rough-toothed Dolphins, along with False Killer, Bryde’s and Sei Whales. Cambodia: I am told that Irrawaddy Dolphins are easily seen at Kratie, eastern Cambodia (about 2 hrs from Pnom Penh), where dolphin watching trips are frequent. Hong Kong: Hong Kong Dolphin Watch run trips to see the pink race of Indo-Pacific Humpbacked Dolphin in the harbour and I saw several in January 1999, though the populations seems to be declining rapidly. There are also Finless Porpoises in these waters, though they hang out in a different area to that visited by the dolphin trips. They can reportedly be seen sometimes from the south of Hong Kong island, though I was told it takes several hours to walk to the best vantage point – Kau Ling Ching along the Lantau Trail. Maldives: I’ve never been but there are some awesome sounding week long trips out of the Maldives each year run by the Whale & Dolphin Company. They seem some great species (19 in all) including Bryde’s Whale, Dwarf Sperm Whale, Fraser’s Dolphin, Rough-toothed Dolphin, Melon Headed Whale, Pygmy Killer Whale, Cuvier’s, Longman’s and Dense-beaked Whale. I really have to go. The Philippines: there is excellent cetacean watching around Pamilacan with very good chances of Spinner and Bottlenose Dolphins, and some chance of Fraser’s, Risso’s and Pantropical Spotted dolphins year round together with Melon-headed and Short-finned Pilot whales. 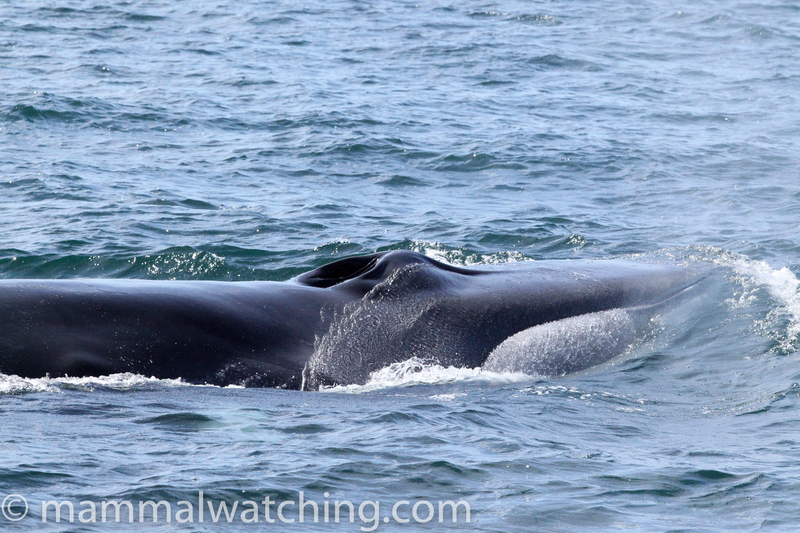 Bryde’s and Sperm Whales are present March through June and Blue Whales occasionally too. Sri Lanka: has good numbers of Blue Whales it seems and a lot of other stuff including Bryde’s and Dwarf Sperm Whales. Trips are organised here by the Whale & Dolphin Company and others. Thailand: The Gulf of Thailand, close to Bangkok, is a great place to take trips out to look for Eden’s Whales and Irrawaddy Dolphins. A nice guide to cetacean spotting in Europe is here. 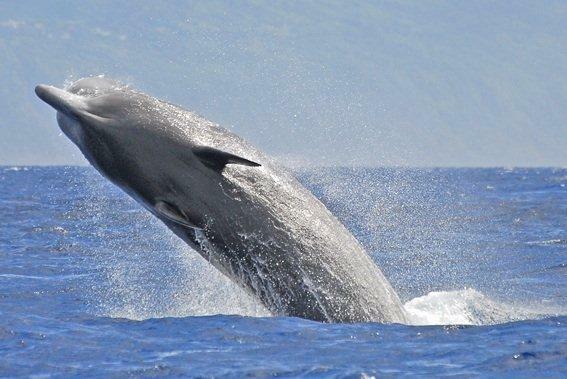 The Azores: have some good whale watching. On Pico Island, for example, boat operators are in contact with spotters on the cliffs. 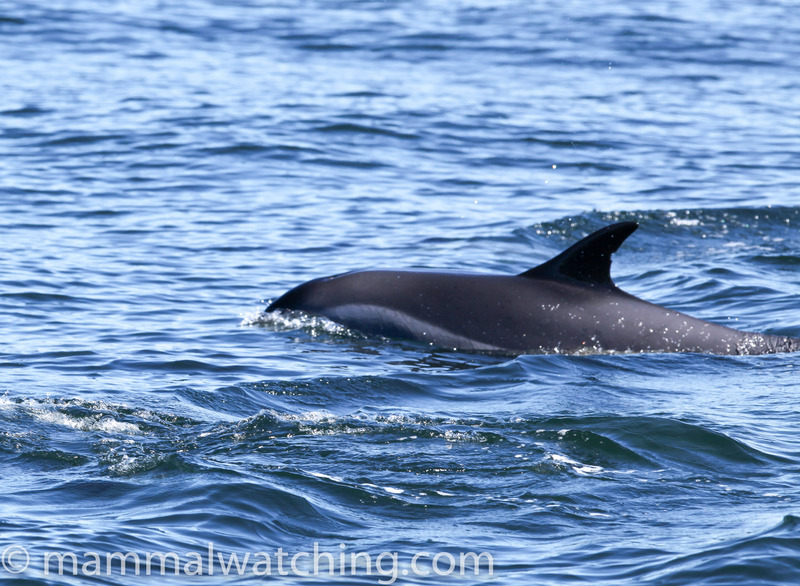 Sperm and Fin Whales are regular as are Pilot Whales and Striped Dolphins. Many different cetacean species are recorded regularly in including Sowerby’s, Blainville’s and Cuvier’s Beaked Whale, Northern Bottlenose Whales, False Killer Whale, Bryde’s Whale, Sei Whale and Short-beaked Common, Risso’s, Atlantic Spotted and Bottlenose Dolphins. Operators include The Dolphin Connection. The Bay of Biscay: in the late 1990s the Bay of Biscay has emerged as one of the world’s best Cetacean viewing areas. The ferries than run from Portsmouth in the UK to Bilbao in Spain spend the last third of their journey running along deep canyons that are teeming with sea monsters in the summer. Unfortunately the ferry schedule changed a few years ago and the boats cover the best areas in the dark. I’ve took the trip once – in August 1998 – and in the first 12 hours out of Spain I saw False Killer Whales (unusual), many Fin Whales, many Long-finned Pilot Whales, many Striped Dolphins, an Orca, a couple of Northern Bottlenosed Whales and a Cuvier’s Beaked Whale (that cruised right past the ferry). And that is by no means an unusual trip. See the Biscay Dolphin Research Programme’s site. The Canary Islands: have some nice cetacean species including Rough-toothed and Atlantic Spotted Dolphins, and Fin, Sei and Sperm Whales. La Gomera seems to be the centre of the action though I haven’t been and know little more about it. Ireland: has some of the larger whales quite often. See this article about Fin Whales off the south coast for example. Japan: also appears to have some good whale watching. Bryde’s Whale is one of the more unusual species that is seen easily in some areas. A number of places are reputedly good for Baird’s Beaked Whale. Other species include Sperm and Humpback Whales, Dall’s Porpoise and Rough-toothed Dolphin. For instance, I read that about 90% of trips out of south-east Honshu see Sperm Whales April-June, Risso’s Dolphins June – September and Dwarf sperm Whales July-September. I would love to find out more. Korea: Finless Porpoises appear to be in permanent residence around Namhae Island. They can usually be easily spotted from the Namhae Grand Bridge, which offers excellent viewing opportunities. Madeira: Peter Cartwright visited Madeira in 2008. Atlantic Spotted Dolphins and Bryde’s Whale are regular in the (northern) summer, and he also picked up Sei and False Killer Whales. He sailed with a company called Rota dos Cetaceos, who have 3 sailings a day from Funchal the capital, and go out in a RIB to swim with dolphins and run dedicated cetacean watching from a motorised catamaran three times a week. Morocco: Atlantic Humpback Dolphins are fairly often seen off of Dakhla. Norway: whale watching around the Lofoten Islands (out of Andennes) is good for Sperm Whales, which we saw in 1996, along with a Minke Whale and a pod of Orcas (uncommon). The UK: cetacean spotting in the UK is best up in Scotland. 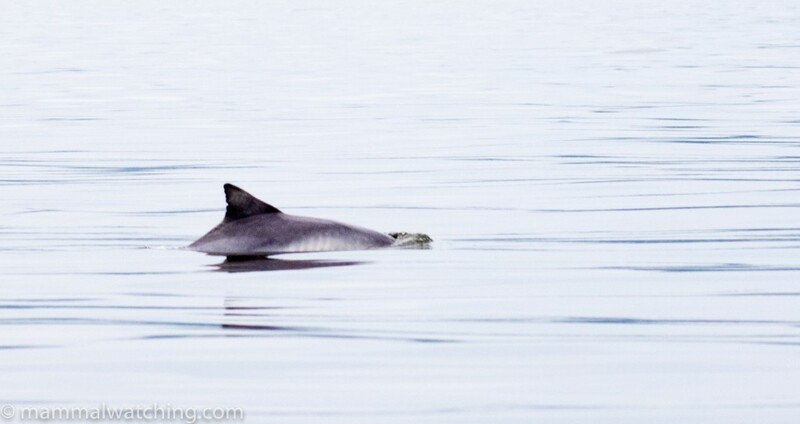 Minke Whale watching is run out of the Isle of Mull, where Harbour Porpoises are common, and Risso’s Dolphins occasionally seen. Short-beaked Common Dolphins are regular in these waters too. Head a bit further north on the west coast (up to Gairloch for example) and keep your eyes open for Atlantic White-sided and White-beaked Dolphins (I’ve only seen the latter there). There are a well studied group of offshore Bottlenose Dolphins (Tursiops truncatus) in the Moray Firth which are easy to see from land. Orcas are fairly easy to find off Shetland.